Best Buy currently has the Wii Fit U bundle on sale, which includes the Balance Board and Fit Meter. It can be purchased for $60 instead of $90, and you can save $30 in the process. If this interests you, check out the official product page on Best Buy here. Note that this deal is valid through today only. Best Buy’s weekly deals are now live, including a very special offer on select 3DS games. Consumers can take advantage of a buy 1, get 1 free offer on The Legend of Zelda: A Link Between Worlds, Bravely Default, Pokemon X, Pokemon Y, Tomodachi Life, Kirby Triple Deluxe, Mario Golf: World Tour, Yoshi’s New Island, Disney Magical World, and Mario Party: Island Tour. It’s valid both in-store and online. Also at Best Buy this week, the white Wii U Pro Controller is available for $20 off. You can also get a $10 gift card with the purchase of select Wii Remote Plus controllers. These offers are valid through July 26. Best Buy will be running a fantastic deal on 3DS games next week. Starting on July 20, if you buy one first-party title, you’ll receive a second for free. 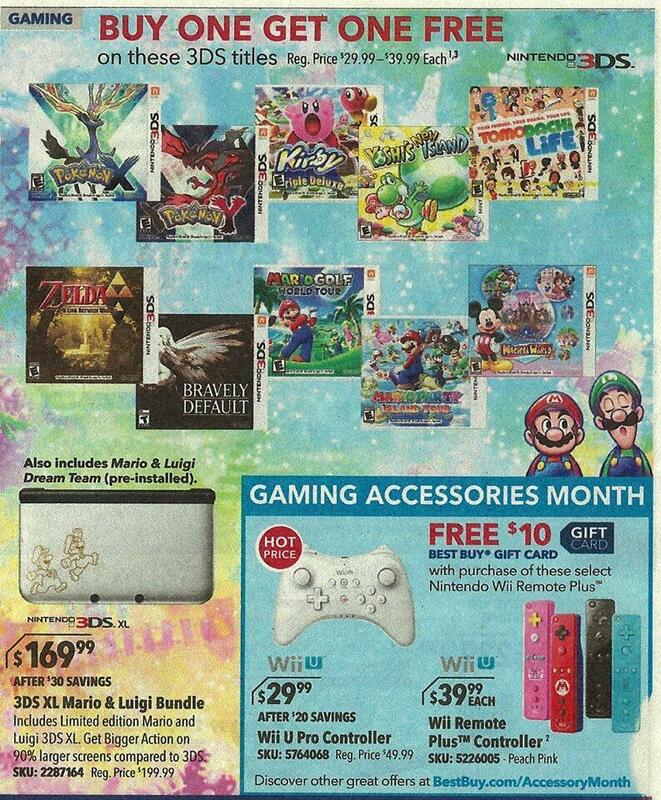 Best Buy showcases games such as Pokemon X/Y, Kirby Triple Deluxe, Zelda: A Link Between Worlds, and more. Best Buy will be offering a few other Nintendo deals as well. These include $20 off the Wii U Pro Controller, $30 off the Mario & Luigi 3DS XL bundle, and a $10 gift card with select Wiimotes. All of these deals will be valid through July 26. If you’re looking to pick up a 3DS game for cheap, Best Buy has you covered. You can grab Scribblenauts Unmasked: A DC Comics Adventure for only $7.99. This sale should be valid both online and in-store. All versions of The Amazing Spider-Man 2 are on sale at Best Buy today. Each console release (including Wii U) has been discounted by $20 while the 3DS version is available for $15 off. If this deal interests you, place an order on Best Buy here. Many would say that Steel Diver: Sub Wars is much better than the original 3DS game that launched alongside the system back in 2011. But if you’d like to experience what the first Steel Diver offered, Best Buy has it on sale for cheap. You can pick up a copy here for only $4.99. Best Buy is selling 2DS systems (Electric Red and Crimson Blue) for $30 off. Normally priced at $130, you can pick up the handheld for only $100. This offer is valid through May 10. Assassin’s Creed III is available at Best Buy for an incredibly low price. The retailer is selling Ubisoft’s game for only $9.99. This price is valid both in-store (including in-store pickup) and online. In what might be the strangest pre-order offers we’ve seen this year, Best Buy is giving out gas credit with Mario Kart 8 reservations. The offer is valid while supplies last, and is valid both in-store and online. Best Buy’s Gas Cash can be redeemed at any gas station in the United States that accepts MasterCard. You’ll just need to enter the code provided by the retailer at www.revupyourkart.com/redeem. Update: Deal has now been price-matched on Amazon . 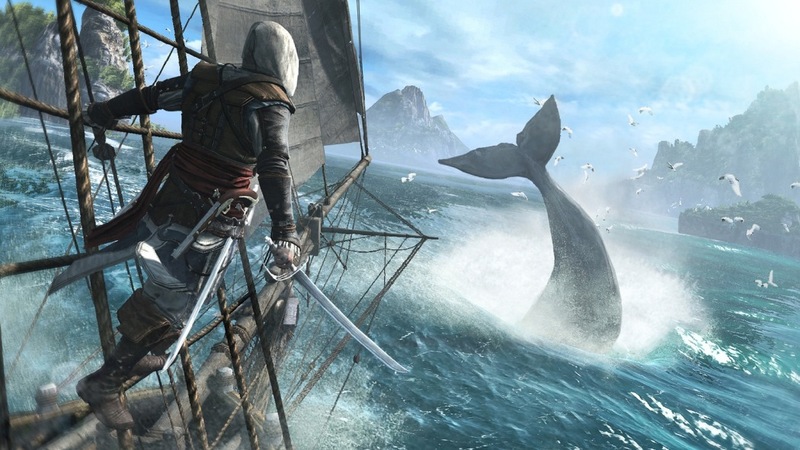 Original: Best Buy has significant savings on Assassin’s Creed IV: Black Flag for today only. Until 1 AM ET or so, consumers can pick up the game for only $13.99. You’ll be saving $26 with a purchase.